Attaches to your belt with a 12" long chain. Three big pockets to hold your valuables. Attaches to your belt with a 12" long chain. 7" x 3" x 1/2". Two pockets for currency, a zipper pocket for keys and change, credit card/drivers license pocket. This is my favorite and is the wallet that I carry today. Features a removable I.D. case, six credit card slots and currency compartment. This is a Celtic design with the Maverick inside. Designs can be anything you desire. Color can also be what ever you want. This is a Celtic design with enough room for currency and 6 credit cards. Designs can be anything you desire. Color can also be what ever you want. Compact and conveniently styled. Has two outside pockets for ID cards, credit cards with a money clip inside along with four more slots for cards. 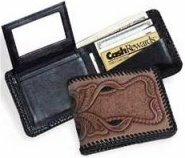 This front pocket wallet 3 1/8" x 3 7/8" holds a few credit cards or drivers license with an outside money clip. This wallet has a place for 6 credit cards plus currency. Measures 3 1/2" x 4 5/8" closed. There are only two cases left. One is unfinished and can be any color or design. One side has a place for two credit cards. Other side has an ID window, plus there is a pocket for Currency. Measures 3 1/4" x 4 1/2". 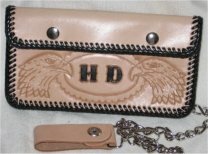 Holds currency, 6" x 3" checkbook and credit cards. 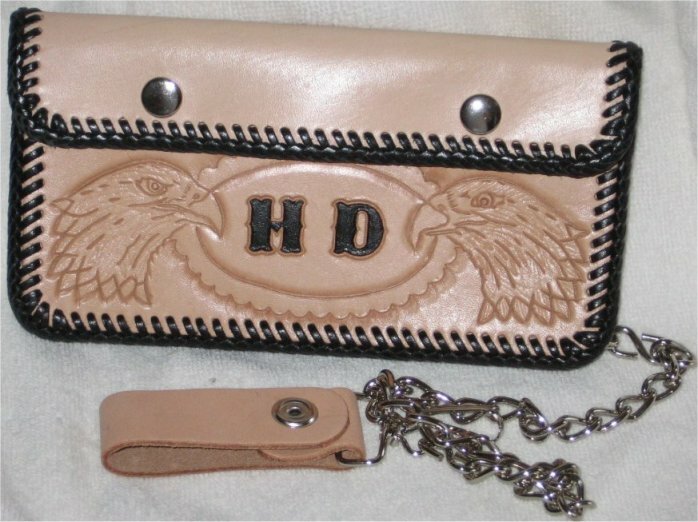 This is a favorite for the man that needs everything in one wallet. Compact and thin, this wallet features a fold-out currency pocket, photo ID pocket, six credit card slots and more. Measures 4-3/4" x 3-3/8" closed. This Passport wallet has a place for your passport, credit cards, currency and a pictured ID. This case was personalized for me. Can be laced or stitched. This Passport wallet is the same as above except for the design. On this one I used a Nautical Compass Star to reprosent travel. Can be laced or stitched. This Small size wallet allows you to conveniently clip your currency to the outside. Includes an outside pocket and two inside pockets for Credit Cards. Inside ID pocket with window. This Money clip has all the style you need. Personalize it with your name or initials or that special design. Size is 1 15/16" wide, 3" long and 3/8" thick. 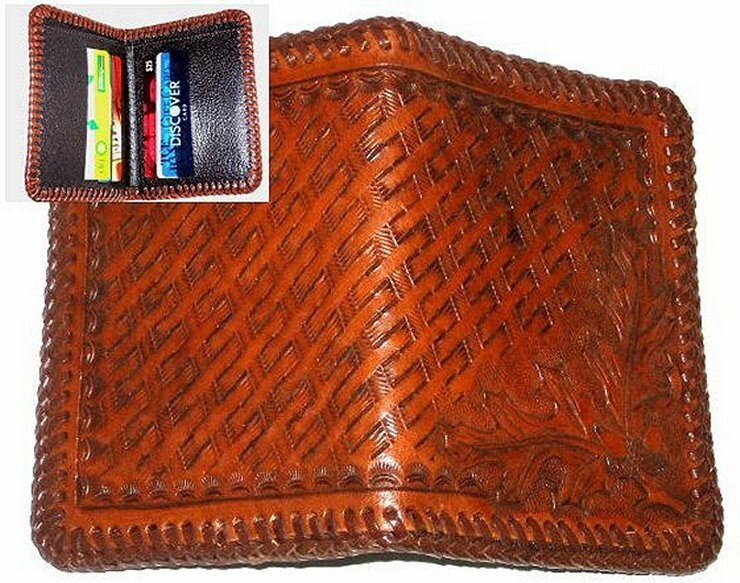 This wallet has a window for ID, Credit Card slots and a big compartment for hard earned cash. Measures 3-3/8" x 4-1/2" closed.